Boiling (or simmering) ham is a moist heat method of cooking. It is also a healthy method of cooking ham because no fat is added during the cooking process. It retains the flavor, tenderness, and moisture through a gentle simmering process. 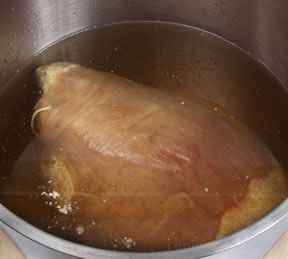 Boiling is a good method to use when cooking dry-cured country hams. Cooking by this method provides a lot of flavor because it draws additional flavor from the meat itself and the bones as the ham cooks. 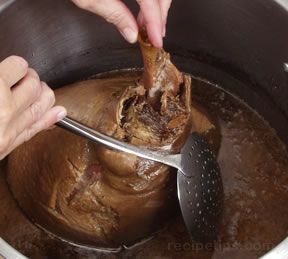 When preparing a boiled ham recipe, additional flavor can be imparted in the meat by adding flavoring or seasoning, such as bay leaves, cloves, cinnamon sticks, sugar, and fruit juices, to the water. 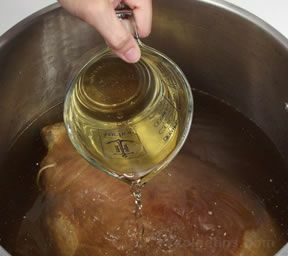 If a ham glaze recipe is going to be used with boiled ham, it is applied at the end of the ham cooking time and cooked in the oven for a short period of time. To boil, place the ham in a large pot or Dutch oven in which the meat will fit fairly tight, and then cover it with cold liquid. Add desired flavorings. 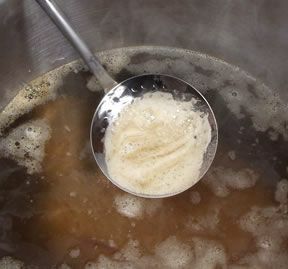 The liquid used for boiling can be plain water, water seasoned with herbs and spices, stock, or water with the addition of ingredients such as wine or fruit juices. Do not use a pan that is too large, avoiding the use of too much liquid. The pan should be just large enough so that the liquid can cover the ham and move freely around it. Slowly bring liquid to a boil, skimming any foam that forms on top. 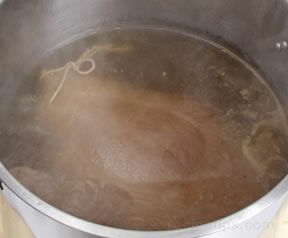 As soon as it reaches a boil, reduce the heat to low so that the liquid is only gently simmering. Cover and let simmer until the meat is done. Cook for 20 to 25 minutes per pound after it starts simmering. 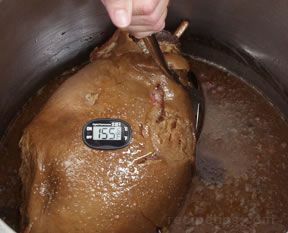 Check the ham for doneness by the use of a meat thermometer, which should show an internal temperature of 155°F. Another indication that the meat is done is when it shows little resistance when stuck with a knife and when the meat starts to separate from the bones. When done, allow the ham to cool in the cooking liquid for several hours. While still warm, take out of the pot and remove the skin and trim layer of fat, leaving 1/4 inch thick. If glazing is desired, score the fat and apply glaze. Place in a roaster and place in an oven preheated at 375° F to 400° F. Bake for 15 minutes or until glaze is nicely browned. See Glazing for more information. Before carving the ham, allow it to cool slightly for approximately 20 minutes. Carve in thin slices and serve. "Interesting, I have never cooked or tried Dry-Cured Country Ham. I wouldn't have known boiling was preferred method for preparing it. Good information. Very informative."